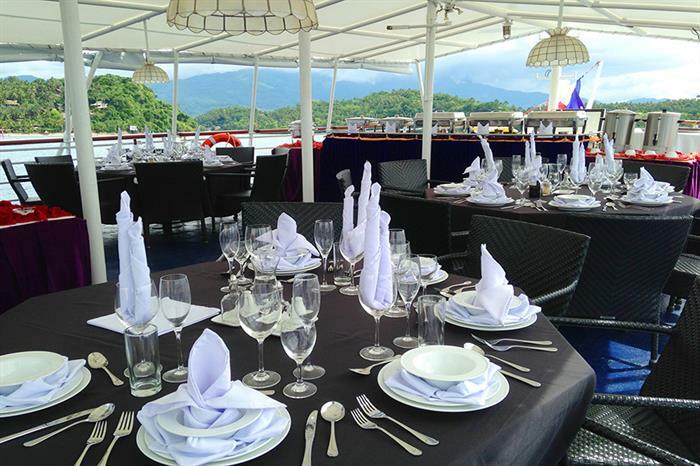 MV Discovery Adventure is the second liveaboard launched by Philippines operator Discovery Fleet. Here’s my first hand liveaboard review of MV Discovery Adventure, which operates 5 day trips to Tubbataha Reef during the 3 month season March to June. It also began operating in Palau in late 2017. 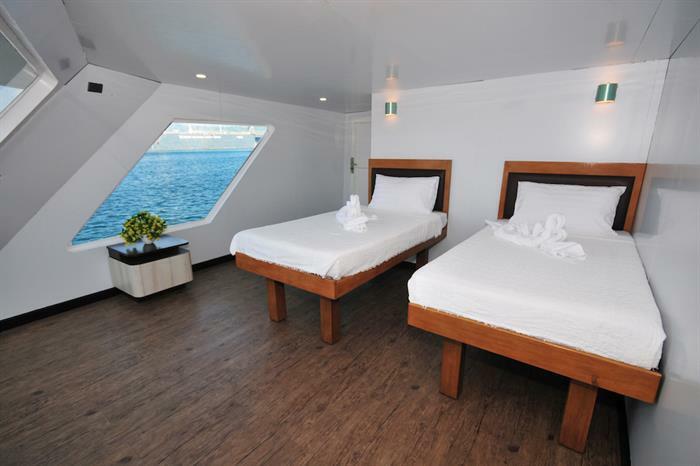 Like its sister ship MV Discovery Palawan, MV Discovery Adventure has recently had a multi million dollar refit and the refurb cost is most evident in the spacious cabins and the huge lounge area which doubles as a dining area, camera preparation station and TV room. There’s so much space it can easily accommodate everyone doing their activities. This is particularly welcome as it’s an overnight journey to Tubbataha Reef so having space to relax is a real bonus. (You can check MV Discovery Adventure’s current liveaboard departure dates for Tubbataha and Palau, pricing and availability, and see my quick guide to diving Tubbataha Reef). The cabins are on the 3rd deck (Upper Deck) at the waterline and the 4th deck (Lower Deck) below the waterline. 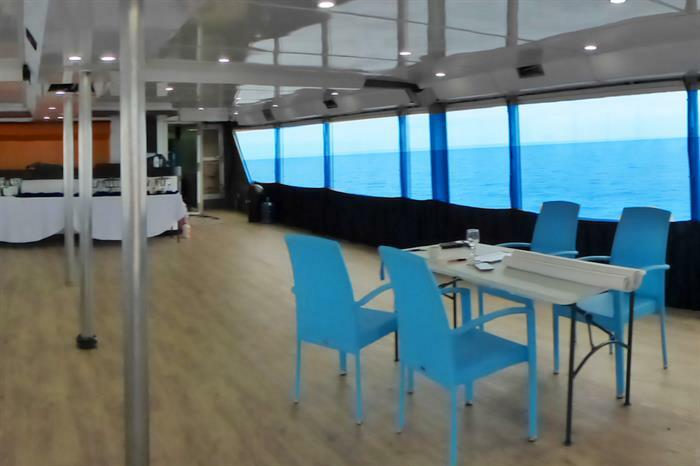 The lounge area occupies the 2nd deck with two VIP cabins facing to the front of the boat. The open air area at the back of the 2nd deck is where dive gear is stored and donned. Divers then head down the stairs to the 3rd deck where the three zodiac chase boats are waiting to speed out to the dive sites. Donning your BCD is done on the zodiac with standard back roll entry. One thing you have to watch out for is that the BCDs are removed from the zodiac and from tanks between dives – when you go to put your BCD on for the next dive, check that the BCD strap has been correctly positioned and fastened before you put it on. Similarly, check nothing has been dislodged like quick release valves or integrated weights. The cabins are big – some of the biggest I’ve seen on any liveaboard. They typically feature a huge window and white walls – very clean and stylish. There were two double beds in my cabin, which makes it feel very luxurious for anyone who’s ever had to suffer being in a small bunk bed on a boat. 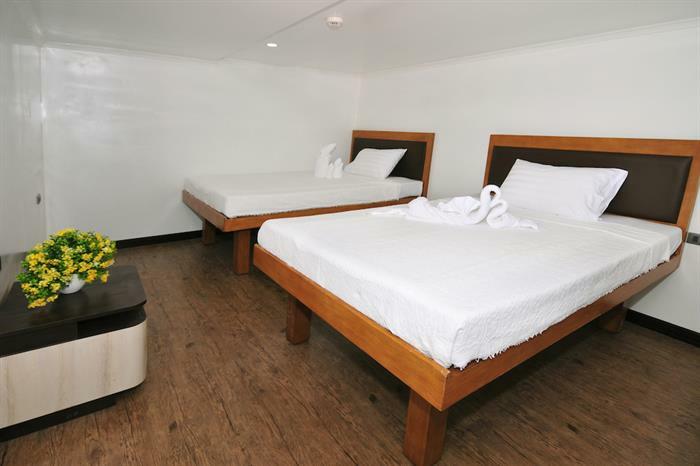 Other cabins typically feature two twin single beds or two queen size beds. 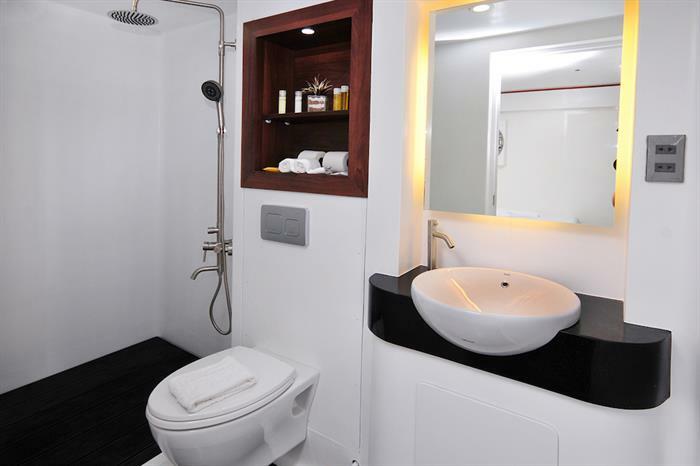 The bathroom size is good for a boat and the only quirk is the door on some cabins which is like a safe door, complete with wheel to spin it open and close – you need to put a bit of strength into it! The top deck is the dining area. It’s very pleasant to eat al fresco and there’s a buffet laid on for each meal comprising of at least four different dishes, plus dessert and constant tea and coffee. The food is solid, hearty fare – although it’s not particularly vegetarian friendly. A nice touch is the egg station at breakfast, which means freshly cooked eggs to order each morning. For a boat that holds 24 divers, it still felt spacious at mealtimes and during the pre-dive and post-dive times messing around with dive gear. I was on the Discovery Adventure as part of a familiarisation trip and there are still some teething problems that were being ironed out. The air con in our room was not particularly powerful and it is centrally controlled ie you can’t adjust it yourself. The shower hot water was intermittent at best – not that big a deal but after a long dive it would be welcomed. Both these issues had been recognised by management and were being addressed. The engine of the Palawan Adventure is currently undeniably noisy. It wasn’t any bother while in the cabins, lounge or dining deck but standing above it in the gearing up area or passing by it in the zodiac coming to and from the dive sites it was noticably loud. On the upside, the crew were friendly and helpful. Our zodiac driver was fantastic – super careful with handling our cameras and very observant and quick to respond to divers surfacing, as well as being very careful and cautious manoeuvring the boat around them. I would have liked to have seen a bit more “tapping the glass” at each mealtimes for the dive manager or guides to proactively stand up and quickly explain what was going to happen in the morning or afternoon – ie dive times etc. The boat holds 24 guests so it’s important everyone knows what the timetable is so people can gear up at their leisure and the zodiacs can depart on time. All in all MV Discovery Adventure is a solid mid price offering with a few quirks but no showstoppers. The liveaboard offers 5 day trips to Tubbataha from March to June. The schedule is typically departure in the evening of Day 1, Dive Days 2 to 6 (5 days diving total), cruise overnight to return to Puerto Princesa on morning of Day 7 and catch your flight or stay on to explore Palawan island. 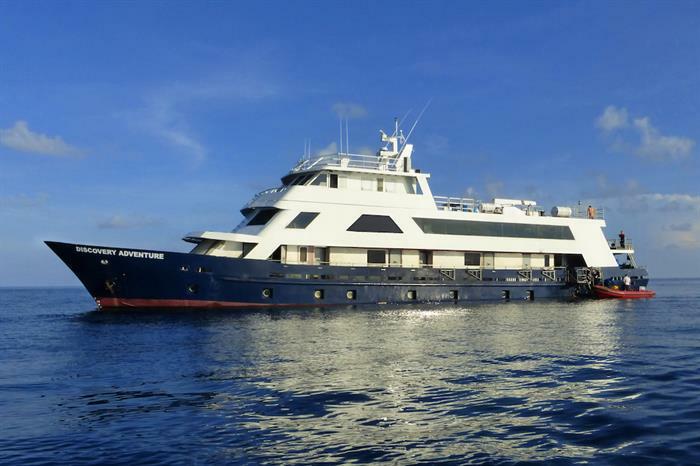 As of 2017, from October to March MV Discovery Adventure also began operating 7 day liveaboards in Palau. 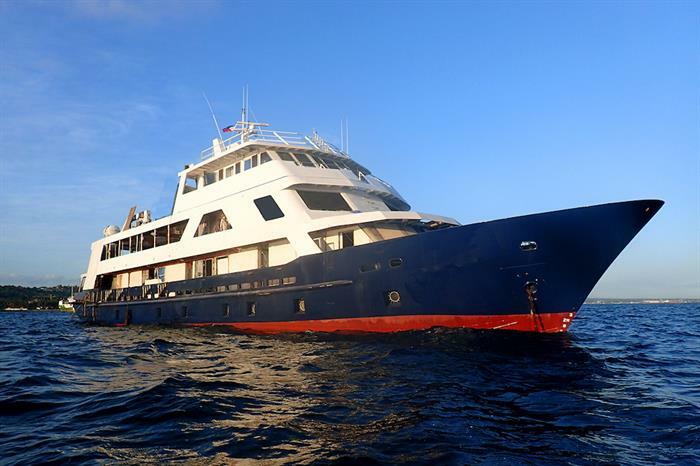 Check MV Discovery Adventure’s current liveaboard departure dates, pricing and availability.